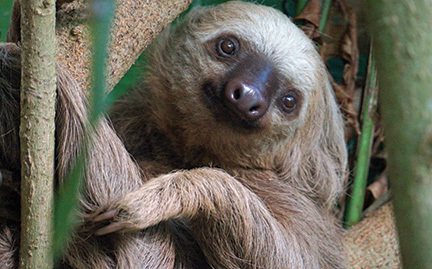 Sloths spend most of their time in the treetops—eating, sleeping, even giving birth there. They are able to get most of the water they need from juicy plants that they eat. Sloths’ long claws and short back legs make moving occasional short distances across land challenging. But they are excellent swimmers and sometimes drop from trees into rivers for a swim, their long arms allowing for easy, long strokes.